Beverly is insistent that she doesn't want to go out for dinner. Jim thinks that sitting indoors all day is not good for Beverly and tries to talk to her but Todd enters and interrupts them. 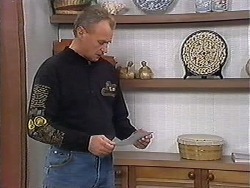 He stares at the box that contained Clarrie's present and goes to his room, Helen returns from the Willis'. JIM: How did it go? In the kitchen an angry Helen tells Jim she made a fool at of herself. Jim still thinks it was Pam but Helen says she wants Jim to stop playing detective. 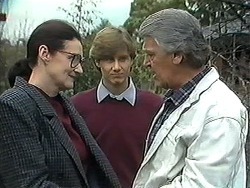 Dorothy is cooking dinner, Ryan wants to know how Clarrie will get back the opal from Helen but he has a plan. Dorothy wants a “celebration” of Clarrie leaving but he takes it the wrong way and leaves in a huff, Dorothy decides its best that he is leaving as they'll never get on. Helen thinks Beverly should have gone out for dinner but Beverly tells her not to start, she is still angry with Jim for leaving her at the hospital, as Helen tries to get her to open up she decides to go to bed. 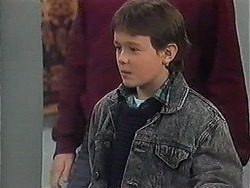 Todd comes in and is worried about Beverly and announces he is going to see Ryan. Doug is at the door, he says Pam is making him apologising for being rude earlier, he thinks Helen should apologise to Pam and she says that it will happen later. As Doug leaves Helen opens the box to find the Opal inside! Clarrie asked Todd to swap the Opals round, he gives him another jewel as a present, and he decides to give it to Cody for her birthday. Doug agrees to sell their caravan so they can solve their money issues, Adam and Cody are disappointed as they used to go on holiday there. Helen rings the doorbell (!) 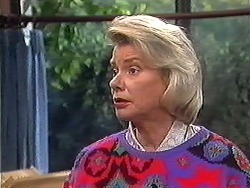 and tells the stunned Willis' now that Doug put the Opal back that it's all forgotten. PAM: I honestly could have thought we could be friends but obviously not. HELEN: What do you want me to do? PAM: You can get out of my house and not come back! 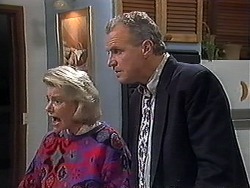 Helen is telling Jim about the Willis' as Todd overhears. 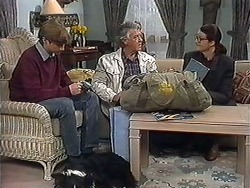 Todd tells them that he took the Opal because Clarrie wanted to swap them. Helen and Jim are angry, Helen is worried how she can apologise to Pam as Todd begs for forgiveness. 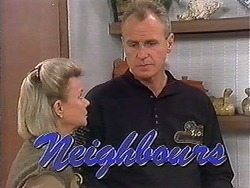 Dorothy and Clarrie are arguing again, Ryan tells them to stop. CLARRIE: That's good of you to try and patch things up but there's no point to it, even as a child she was closer to her mother. 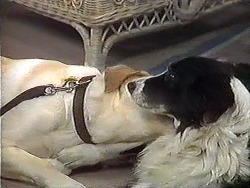 It's Stella who kept the family going and when she died Dot didn't want anything more to do with me. DOROTHY: What on earth gave you that idea? Clarrie asks why she never asked him for help when her mother died, Dorothy was worried Clarrie would react badly. She goes on to say that she was always trying to impress him, all the time. Clarrie says she is very precious but Dorothy says he needed to tell her sometimes. Helen apologises again, it's a bit awkward as Doug is unimpressed, Pam accepts the apology and even Doug begins to come round and Helen leaves. PAM: I feel like that cuppa now. DOUG: Alright, where's my wallet? PAM: Maybe Helen took it! Dorothy decides that she and Clarrie are too alike, Dorothy talks about the AA meeting Clarrie went to. She wishes he had told her what was happening when her mother died (the drinking etc.). DOROTHY: I wish you didn't have to go away. Clarrie says he will be back and that they will get on better after everything is in the open. 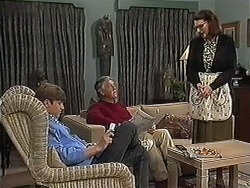 The next morning Clarrie gives Dorothy a book of her mother's favourite poetry and Ryan some money towards his car. He says he has enjoyed his stay and will miss them both. Clarrie says he wants to impress Helen next time he is here, Toby arrives so Bouncer can say goodbye to Rosie. 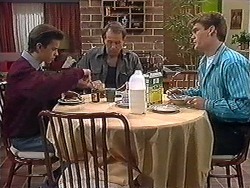 Toby wants to “adopt” Rosie, Clarrie says he will be lonely without Rosie and Toby decides that it will be OK.
Adam is hogging the bathroom and Cody is late for school, Todd apologises to Doug for the Opal incident and they agree to forget about it. 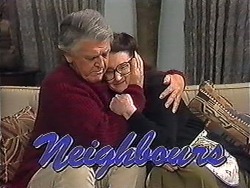 Helen and Clarrie say goodbye, they hug and Helen leaves. Clarrie says that Dorothy and Ryan must visit when he gets settled, they all hug and Clarrie sets off with Rosie in tow, Dorothy looks sad. 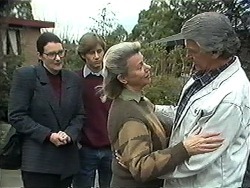 Helen tells Jim that she will miss Clarrie, Jim says that Beverly has gone out but they've no idea where, Jim goes to search the house (in case she is hiding I presume). Beverly has left a note though. Helen is worried that Beverly will do something silly.